I’ve been critical in the past of Vine, and brands’ often clumsy attempts to turn it into the next venue for “clever” real-time marketing. But with a new series of 10 inherently useful Vines, Lowe’s demonstrates that six seconds is plenty of time to create Youtility. The paint tray liner Vine is also noteworthy in that it doesn’t advocate for a purchase, and in fact actually recommends to the viewer an alternative so that they don’t have to buy a product from the company. Now THAT’s taking the long-term view of helpfulness and customer acquisition. While this Vine program is indeed terrific, it’s part of a broader Lowe’s initiative around Youtility. The Vines themselves were an offshoot of a prior, ongoing Facebook effort by the brand called Shareable Solutions, whereby they post helpful tips via a single photograph. Several of the Vines repurposed from the Shareable Solutions program, and according to Walters, the active Lowe’s Facebook community encouraged the company to try the Vine platform. 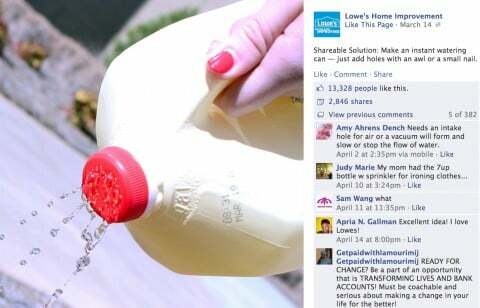 This example, of crafting an ersatz watering can out of a milk jug, generated an astonishing 16,500+ engagements on Facebook, including nearly 3,000 shares. This notion of repackaging and repurposing your successful content is critical, as companies of all sizes are attempting to create more and more information assets to trigger loyalty through Youtility. You don’t have to reinvent the wheel. You just need to “reimagine” the wheel, as Ann Handley of MarketingProfs often says. In this case, Lowe’s found something that worked in one place, and tweaked it for a different online venue. Smart. Facebook. Vine. YouTube. For Lowe’s, it all works together as parts of a master plan to win hearts and minds by teaching more and promoting less. What other companies are embracing Youtility on Vine, or elsewhere?